It is a sleek wine cooler perfect for up to 16 bottles, with the removable racks you can also store beer too. The reflective glass front makes it eye catching and looks great on your worktop. 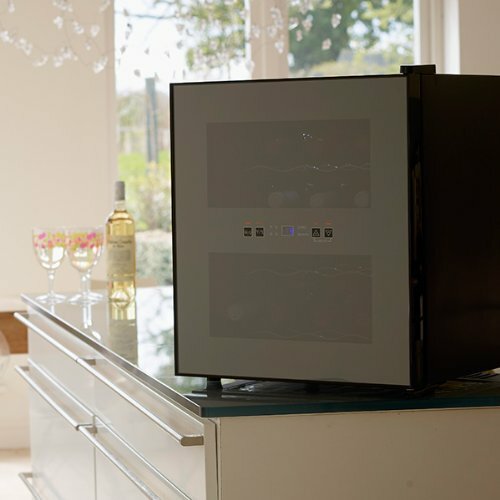 This Husky wine cooler is a stylish and sleek design that is perfect for kitchen worktops, it will hold 16 wine bottles removable racks and has a touch screen interface on the front. The Reflections Wine Cooler is a stunning design, it has a black metal case and has a beautiful black tinted and reflective glass door, this has two panels where you can see the wine bottled inside, and in the middle of the door are the touch controls. Here you can adjust the temperature up and down using the touch controls. Unfortunately the door cannot be reversed so this cannot be adjusted due to the touch control panel, the 4 chrome-plated scalloped wine shelves within the fridge are removable so beer bottles could be sorted if you wanted too. This Husky wine fridge holds 16 bottles and with the removable racks could hold beer bottles stood upright too. The temperature range of this Husky Reflections Wine Cooler is 8-18°, for most the lowest 8 degrees should be enough however if you like your white wine kept cooler than this then we recommend looking at some alternatives. Reviews and comments left on Amazon mention this however if you are not to fussed by this then this is certainly a great looking cooler that does the job well. Overall it is a sleek wine cooler perfect for up to 16 bottles, with the removable racks you can also store beer too. The reflective glass front makes it eye catching and looks great on your worktop, the downsides are the lowest temperature being 8 degrees and the door is fixed and cannot be hung on the other side. Apart from these it is a great fridge and looks great, it is well priced and good value.